Earn 245 - 345 points upon purchasing this product. Use 2450 - 3450 points to purchase this product! SIBO, HIV-1, Influenza virus, paramyxoviruses, rubeola virus, bronchitis virus, and the herpes family of viruses (Epstein-Barr (EBV), Cytomegalovirus (CMV), zoster (Chicken pox), varicella-zoster (shingles) and herpes type I and II). Sadly, monolaurin had no effect on diseases caused by non-enveloped viruses such as the polio virus, coxsackie virus, encephalomyocarditis virus, rhinovirus, and rotaviruses. 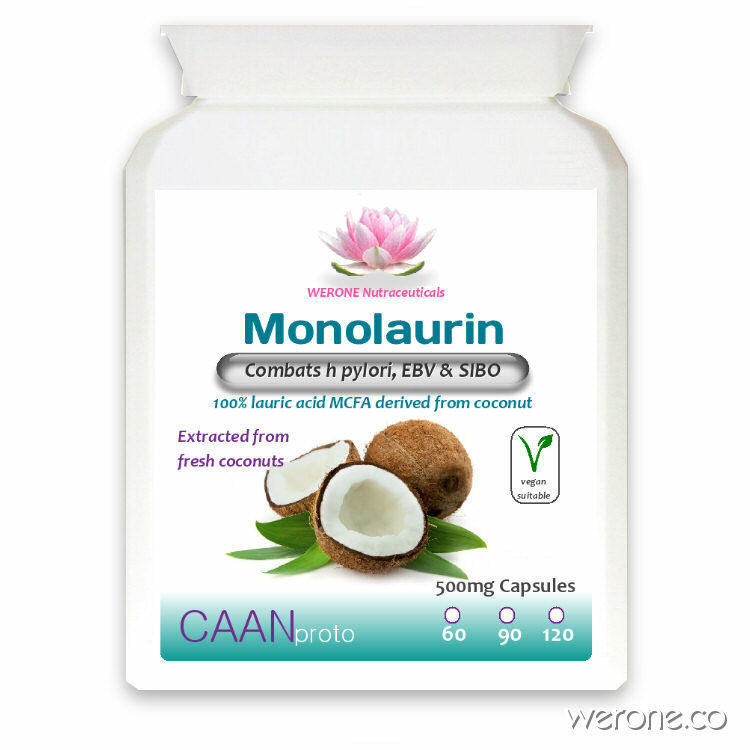 The antiviral and antibacterial action attributed to monolaurin are that of making soluble the fats in the protective envelope, causing the disintegration of the microbial membrane. This process works more efficiently when combined with metal chelating agents, such as EDTA and Bovine Colostrum ( lactoferrin), and mucolytics, like NAC. See Pathogest which includes Monolaurin. Die-off of pathogenic bacteria should follow usage of antibacterials, take Activated Charcoal to soak up the debris and black tart morello cherries to reduce the levels of ammonia. Suggested Usage: Take 2-3 Monolaurin capsules a day with food. Up to 3g a day for more challenging issues.